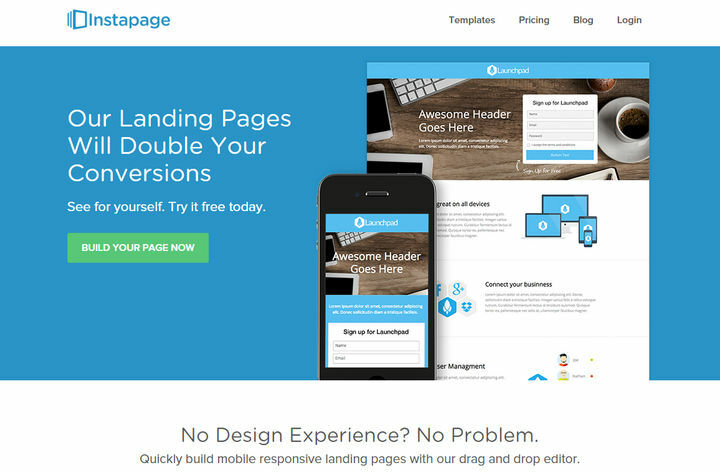 Instapage is a powerful online landing page creator tool. It has an intuitive drag and drop user interface which could be used to design a complete landing page. The fully responsive landing pages could be integrated with 20+ email marketing, social, CRM and optimization tools. Besides the ready-made templates, the landing page service also has A/B testing feature. This is useful for creating multiple variations of the same product and find out which one works the best for you. Let’s see what are the pros and cons of Instapage. Free: $0 per month. 1 landing page, 100 monthly visitors, A/B testing, all integration. Basic: $29 per month. Unlimited landing pages, 5,000 monthly visitors, A/B testing, all integration, mobile responsive. Professional: $79 per month. Unlimited landing pages, 25,000 monthly visitors, 2 sub-accounts, template importer, phone support. Unlimited: $179 per month. Includes all the benefits of professional plan, unlimited sub-accounts, unlimited visitors. Is Instapage Right for You? The user interface of Instapage is simple and clutter-free. Therefore, if you are a beginner and looking for an affordable solution to create landing pages, Instapage could be the perfect choice for you. If you are not sure, you can get started with the free account or the free trial. Some popular alternatives to Instapage include LeadPages and Unbounce. Instapage makes the whole landing page creation process very easy. There are plenty of templates and a powerful editor for creating your own designs. You can create professional looking landing pages without requiring any designer or developer skills. Do you use Instapage or any other landing page creator service? If yes, please share your experience with us by leaving a comment below.